Severe acute kidney injury (AKI) secondary to myeloma cast nephropathy (MCN) and requiring acute dialysis is associated with poor patient survival. MCN is caused by the pathogenic (involved) immunoglobulin serum free light chain (sFLC). High cut-off haemodialysis (HCO-HD) can remove large quantities of sFLC and retrospective uncontrolled clinical trials using HCO-HD have reported renal function recovery (from dialysis) in over 60% of patients. This is compared to historic reports of 20% renal recovery. Recovery of renal function is associated with improved survival. However, it is not known if these better outcomes were associated with HCO-HD or novel chemotherapy regimens. There have been no RCTs of the efficacy of HCO-HD or the efficacy of bortezomib based chemotherapy in patients with MCN and severe AKI requiring dialysis treatment. To carry out a prospective multi-centre RCT in patients with newly diagnosed MM and associated MCN who required acute dialysis treatment, comparing HCO-HD to standard high flux (HF)-HD, and using bortezomib based chemotherapy as the standard of care. Ninety patients with a first diagnosis of MM & MCN confirmed by kidney biopsy, sFLC levels of the involved LC >500 mg/l (Freelite™), and a requirement for acute dialysis, were randomised to receive HCO-HD or standard HF-HD. HCO-HD was carried out with two 1.1 m2 Baxter-Gambro HCO 1100 dialyser in series. The dialysis regimen was based on studies that identified an optimal protocol for FLC removal. All patients received bortezomib, doxorubicin, and dexamethasone chemotherapy to a maximum of 8 cycles. Primary outcome was independence of dialysis at 3-months. Patients were followed for 2-years. Other pre-defined outcomes included; 3-week sFLC levels, overall renal recovery, stem-cell transplantation, 2-year OS. All results are reported as intention to treat (ITT). Where statistical tests are not stated the chi-squared test is reported. There was no difference between groups for sFLC levels (mg/L, median, range (Mann-Whitney test)) by isotype at randomisation. These were: kappa LC; HCO- HD 12000 (1839-61900), HF-HD 11800 (1200-76322), lambda LC; HCO-HD 6031 (1950-33196), HF-HD 8400 (574-38400). There was no difference at randomisation between HCO-HD and HF-HD for age, ethnicity, gender, myeloma type (light chain only vs intact Ig). Serum FLC levels levels on the first full protocol dialysis decreased for kappa LC and lambda LC by 75.6% and 71.2% for HCO-HD, and 20.2% and 9.1% for HF-HD, respectively (P<0.001). However, there was no difference in the percentage reduction of sFLC level from baseline at 3 weeks between HCO-HD and HF-HD. 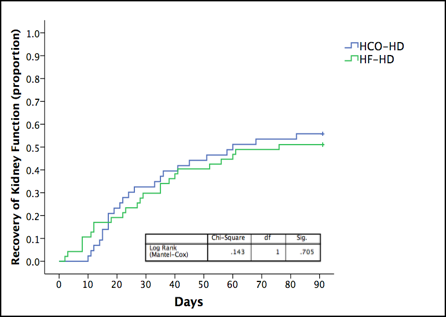 24/43 patients (55.8%) in the HCO-HD group and 24/47 patients (51.6%) in the HF-HD group recovered renal function by 3 months (not significant, NS). Kaplan–Meier analysis is shown in the figure. Overall recovery of renal function was 62%; 58.1% in the HCO-HD group, 66% in the HF-HD group (NS). 35% in the HCO-HD group and 32.2% in the HF-HD received a stem-cell transplant (NS). OS at 2-years was 24 (55.8%) in the HCO-HD group and 36 (76.6%) in the HF-HD group (P=0.037; odds ratio (95% confidence interval), 1.583 (1.048-2.392)). There were more lung infections in the first 3-months in the HCO-HD group (12 vs 3, P=0.014). In this RCT, where all patients received bortezomib based chemotherapy, 62.2% of patients recovered renal function and overall survival at 2-years was 66.7%. HCO-HD, compared to HF-HD, did not improve renal recovery rates in patients with severe AKI secondary to MCN. There was worse overall survival in the HCO-HD group.